During a one on one session, you will receive clarity about what you want in your design. We work with you to brainstorm preliminary ideas utilizing in-store samples and our expert, in-house designers. 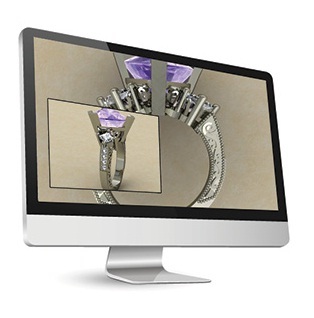 Your design is then entered into a specialized, jewellery design computer program that generates a 3D image of your ring for you to approve. Upon approval of your design, this program is used to produce the wax model. Your design is sent to 1 of 3 state of the art wax printing machines, chosen based on the exact technical needs of your unique design. 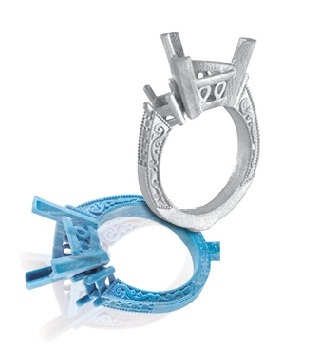 See your wax model ring in your hand before it is enters casting. After your approval, the wax model is delicately cleansed and prepared for the next step. 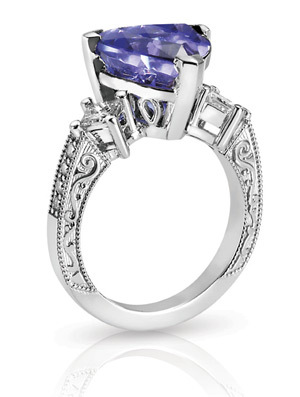 Using the wax model, a cast of your ring is created in your choice of metal. We only use fresh, never used gold for each casting. It is widely accepted to reuse scrap gold but this comes at the cost of craftsmanship. Reused gold can be difficult t set stones in and is prone to cracking. Using only fresh, never used gold ensures your stones are set perfectly creating strength and an unmatched look. We use sophisticated cleaning instruments that remove every last imperfection from your ring. The ring then goes through an extensive 9 step polishing process, revealing the true beauty and shine of gold.